Salespeople are email people. We spend long stretches of our day in the inbox, cultivating leads, maintaining existing relationships, and maybe hitting refresh just one more time. But despite the hours we spend emailing, few businesses (or salespeople) look at emailing as a true business process that can be measured and optimized. This laissez-faire approach to emailing is a missed opportunity. Let’s take an objective look at this cornerstone of the sales process—and make those hours of emailing more efficient. The Lean Startup methodology, pioneered by Eric Ries, is an increasingly popular product development philosophy that seeks maximum efficiency in every corner of a business. 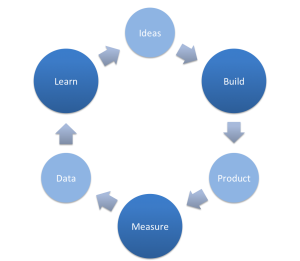 At the core of this philosophy is the Build-Measure-Learn feedback loop, in which teams build a product, get feedback from users, and use that information to improve. So how can we apply Build-Measure-Learn to sales emails? Well, in the past, the only way to get feedback on a sales pitch was to have an awkward conversation with your prospect. But now that we can arm ourselves with extensive data from one-to-one email tracking tools like Yesware, we can easily apply this data-driven startup philosophy to sales. Build: Sure, an email isn’t a product in the traditional sense, but that doesn’t mean you’re not building something when you write one. Subtle changes to the intro or even the tone can make all the difference in creating a real connection with another person. The key here is to keep track of what you said to whom and whether it worked, so you can learn from your mistakes and build better emails going forward. Measure: You can’t improve what you don’t measure. Some salespeople rely on Google’s “Canned Responses” feature to save and organize their commonly used messaging. Yesware has also developed custom templates that you can edit on the fly and later analyze for effectiveness. Be sure to review your Template Reply Report over at least a two week span to keep track of how many times you used each template, open rates, and response rates. Low open rate? Invest some time in coming up with new subject lines. At Yesware, we found that subject lines with more than three words have a lower than average open rate. The key is to be brief, while clearly communicating the value of what’s inside. Low reply rate, but a high open rate? Rethink your content. Make sure that your email speaks to your customer’s needs and how you can help. Otherwise, you’re just wasting their time. Low reply rates can also be a sign that you need a stronger call to action. Simply closing an email with a question can greatly improve your chances of receiving a response. For more information on how to optimize the sales email process, register for our free webinar with BatchBook this week on July 24.